Reading these…both are wonderful. I shouldn’t be reading both at the same time but I am…I tend to want to focus on Little Fires Everywhere, though…it’s not even that I am more into it. I just am too lazy to put it down. Also it takes place in Shaker Heights…near Cleaveland…near where I grew up. It mentions a lot of landmarks that I am familiar with. I had my oncology check up today. Everything was fine except for one weird fluctuating number. So…I pray that the weird fluctuating number stops fluctuating. Lucy looks so sad…old, delicate and fragile. It’s so hard to make sure that she is ok while we run and play with Roxie to make sure she is happy and content! Sigh! This is Den at Ethan Allen while we chose his chair fabric. It took us three seconds to choose…a yummy gray. Look at this! 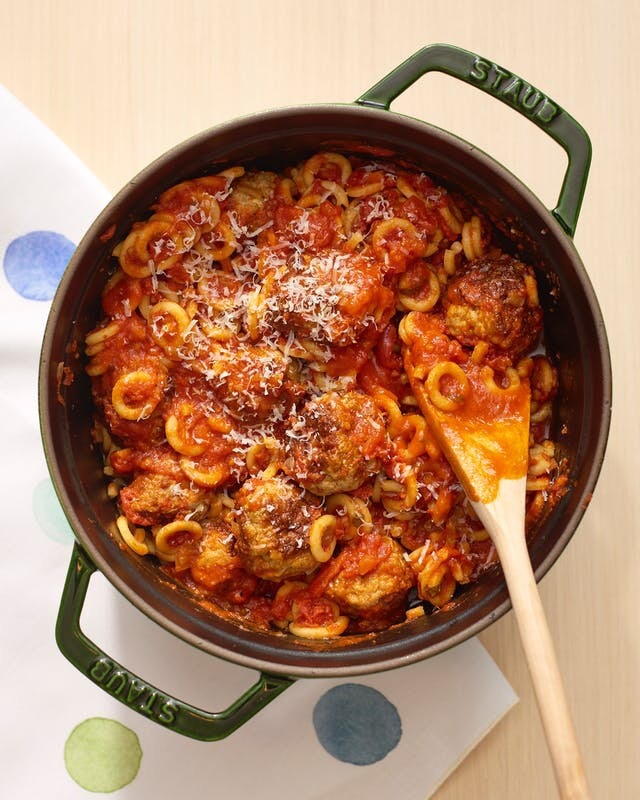 Grown up meatballs and O’s…from The Kitchn…I am on a quest to find that pasta! I want that Staub Pan, too! Ok…time for lunch! 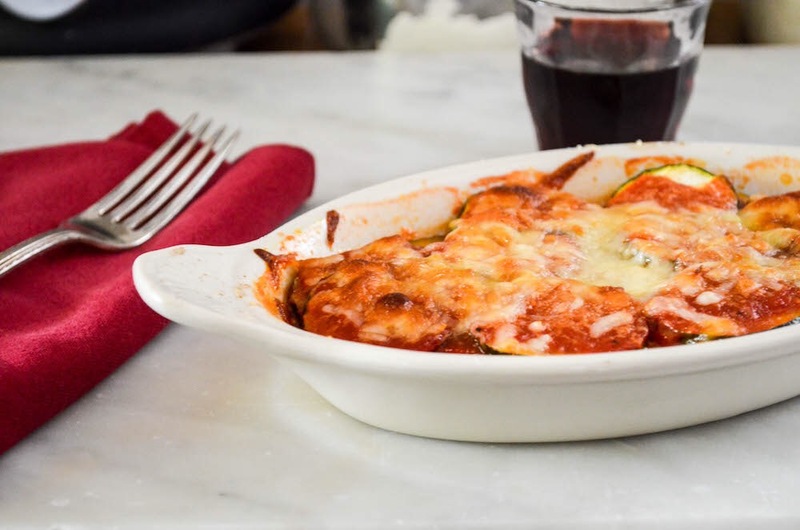 We are having Zucchini Parmesan for dinner…it’s the recipe I love from Jennie’s Kitchen. It’s Always About Books And Perhaps A Few Other Things! Wow! I just got this notice. It is the first one since your move. I am glad you and the doctors have a good rapport. It sounds like they have a handle on things. Prayers. Keep the conversation with them going. Lucy will be fine, because she knows you love her. She trusts you to be there for her; you are. Roxy, as well. She knows you are there for her. This is what love does. But, you know that. You’ve got this…and you have the support of those who care. HUGS. 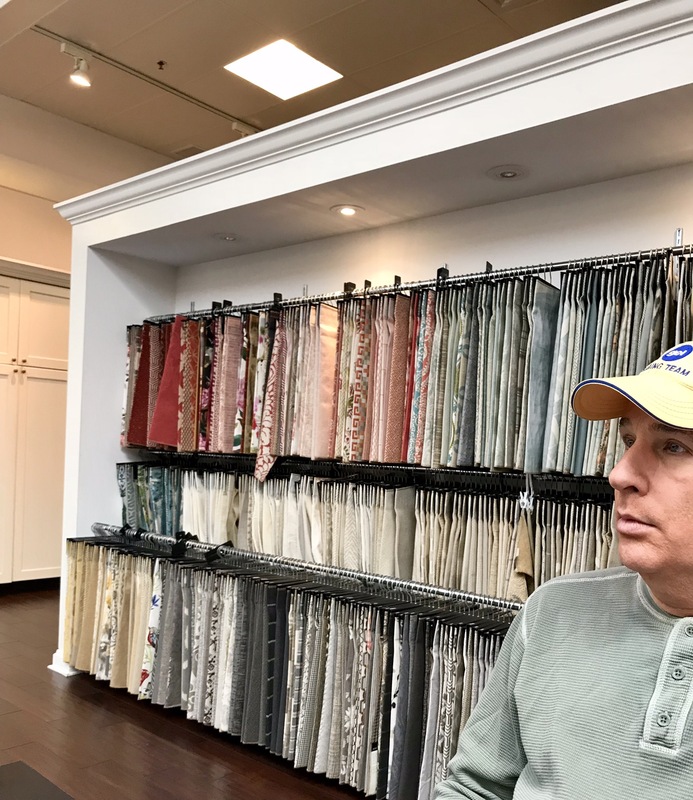 Choosing fabrics can be fun or frustrating. Glad Den found one he liked right away. Sending good thoughts to Lucy. Enjoy your day. I’m having lunch at The Olive Garden with a friend/former colleague. Enjoy your endless salad bowl! Den is happy! Oh, no! I wasn’t complaining… it looked so good, I wanted to see the recipe. And it was very simple to find! You always seem to introduce me to new food/recipe sites, and I love that! I’m praying for your weird numbers too! What’s the next step? The last time we picked out chair fabric I was overwhelmed by the decorator at the store steered us in the right direction. Another blood test in 6 weeks…sigh! The fabric was easy…I didn’t veer from what I wanted. 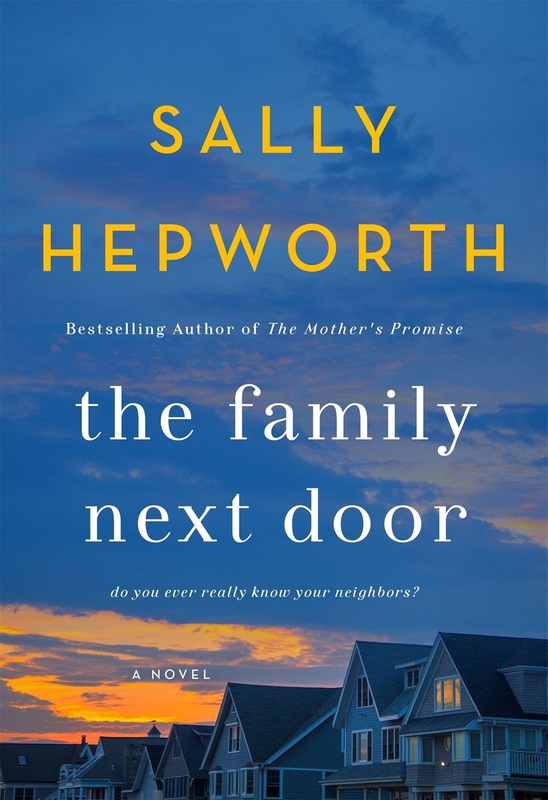 I love when books are set in places I’m familiar with! I do, too! Thank you for your help! I’m holding off until New Year on the Hepworth book and now want to read the Ng book. I have two Staub pots – one is an oval that I love. Had them for many years. I need to find an upholsterer to redo a chair (from Ethan Allen!). Praying the blood test number starts to behave. Thank you, Mary…apparently this number can go up and down but I prefer down. Staub pots are new to me but I love them! It is always fun for me to read a book when I know the places. Hoping the blood tests start behaving. 🙂 Sending hugs and good wishes. Thank you…I guess I have to realize my life will always be different. 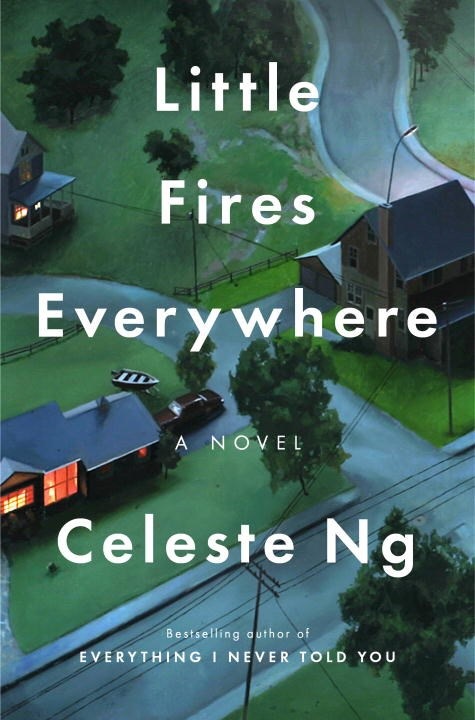 LOVED Little Fires Everywhere. My review posts tomorrow but towards the end I could not put it down until I turned that last page. I am so glad that your numbers are good but a fluctuating number could be due to so many things depending on what it is. What did the doc say about it? It’s the CA 125 number that does fluctuate but it could mean cancer somewhere else. It’s never good when that goes up. How fun to choose chair fabric. I used to be able to afford Ethan Allen. Our bedroom set is from them. My husband notices the weight of real wood compared to IKEA stuff whenever he has to move things around, LOL. I love IKEA stuff but this chair needed to be sturdy and special…we lucked into their 30% off sale…so that really helped!